India’s great ecommerce wars are well and truly on, and the three main players – Flipkart, Amazon and Snapdeal – are battling it out for a share of the Indian consumer’s attention this festival season. This is what the first 3 pages of the Times of India looked like today. Flipkart’s much vaunted Big Billion Day sale around the corner, and all eyes are on the event after the fiasco last year when the sale had left thousands of customers angry and the company had to issue an apology for the site crashing repeatedly. 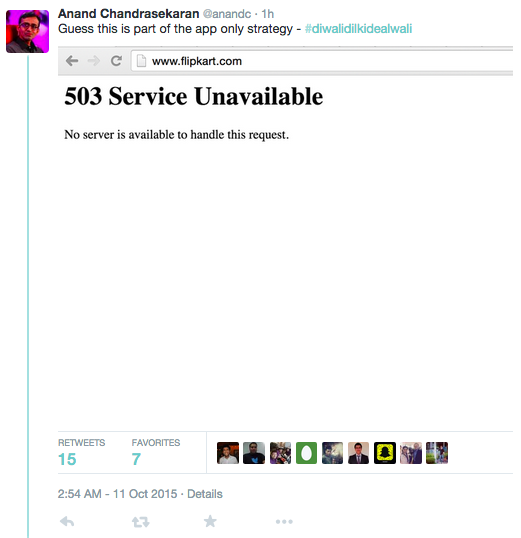 Two days before the big event this year, Flipkart’s site briefly went down again, and fierce rival Snapdeal’s product officer, Anand Chandrasheharan, had this to say on twitter. Chandrasekaran was referring to Flipkart’s push to bringing its app to the forefront, for which the company has introduced several strategies, including making certain products available only on the app, making its Big Billion Day Sale app-only, and most drastically, considering shutting down its website altogether. Snapdeal has been vocally critical of the strategy in the past, with CEO Kunal Bahl dubbing it the “most consumer unfriendly move”. Flipkart was quick to respond though. Silicon Valley veteran and Flipkart’s current Chief Product Officer Punit Soni had a measured response to Chandrasekaran’s tweet, and even threw in a mention of the Big Billion Day for added measure. Things are only getting started. Expect more barbs to be traded between the two sides as we move into the festive season. Top Indian Startups In 2015 India’s Mega Startups Are Helping Build A Healthy Entrepreneurial Ecosystem Flipkart’s Latest App Push: Its Big Billion Day Sale Is App-Only Flipkart Disables Certain Products From Its Website In A Bid To Get Customers On Its App Snapdeal, Micromax Founders Schmoozing On Twitter Over YU Flipkart Issues Legal Notice To Blogger Who Started FlipkartVsAmazon.com Flipkart Puts App-Only Plans On Hold; Jibes From Competitors Begin Snapdeal’s Losses Rise Fivefold To Rs. 1350 crore Flipkart, Myntra Delivery Staff On Strike Demanding Better Amenities So Which E-Commerce Company Is Winning This Festive Season?